Inviting. Make that a key criteria in flavor (and aroma) selection for your dairy foods innovation this coming year. Ask yourself if the product invites the shopper to try it. 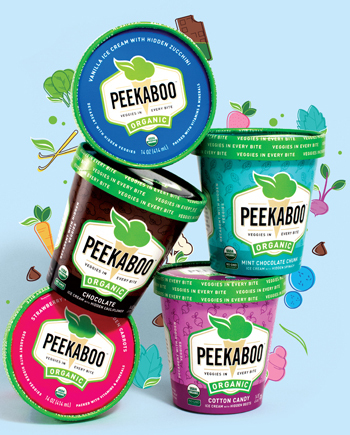 While label claims—such as lactose free, high protein and contains probiotics—and a product’s story—everything from the dairy farmers to ingredient sourcing--invite shoppers to explore new entries in the refrigerated and frozen dairy cases, when appropriate—flavor—is often the real enticement. This is especially true for limited-time offerings, including seasonal items. While pumpkin pie yogurt and hot cocoa ice cream both sound quite festive, Grandma’s Butter Crusted Pumpkin Pie and Melty Marshmallow Cup of Cocoa invite trial. Perry’s Ice Cream is doing just that with Elf Trash, a white chocolate ice cream with red and green fudge candies, fudge-covered pretzels, fudge-covered peanuts and praline peanuts. 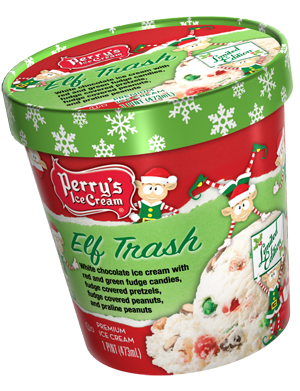 The pint package is whimsical and features the fourth generation, family-owned ice cream company’s head elf. 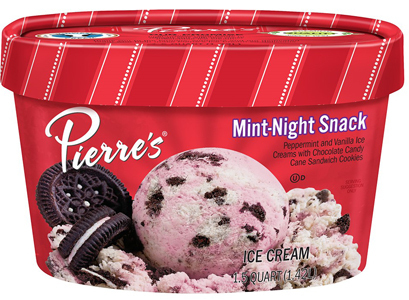 Pierre’s Ice Cream Company is also doing this with its new seasonal Mint Night Snack Premium Ice Cream. This 1.5-quart package is peppermint and vanilla ice cream swirled together with special chocolate candy cane sandwich cookies. So what are the three flavor and aroma themes driving innovation? 1. Culinary Inspiration. Not sure if a bucket of KFC’s Original Recipe qualifies as culinary inspiration to everyone, but nonetheless, it fits the bill. What’s really trending is the inclusion of cooking terms—and flavors—in product descriptions. Think poached pears, smoked pecans, caramelized apples, grilled pineapple and roasted cocoa nibs. Coolhaus offers ice cream flavors such as Brown Butter Candied Bacon (brown butter base ice cream with brown sugar candied bacon), Fried Chicken and Waffles (brown butter maple ice cream with maple candied chicken skins and caramelized waffles, pictured in scoop below) and Nutella Toasted Almond Chocolate (hazelnut ice cream base with toasted almonds). Each of these flavor systems would work well in spreadable cheese, or a sour cream or yogurt dip. Think about a savory dual-compartment yogurt. 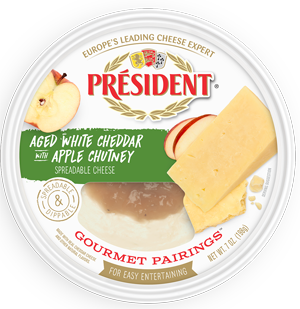 Lactalis Group is rolling out Président Gourmet Pairings. The line is debuting in three flavor combinations: Feta with Roasted Red Pepper, Blue Cheese with Caramelized Onions and Aged White Cheddar with Apple Chutney. The smooth and creamy cheeses with culinary-inspired gourmet toppings are for spreading and dipping. They come in 7-ounce tubs intended for merchandising in the specialty cheese department. The ready-to-serve packaging is designed with a clear, semi-circle, cut-out window for visible toppings and a clean aesthetic for easy display. This brings me to the next flavor trend. 2. An Ethnic Twist. This is not full-blown international cuisine. 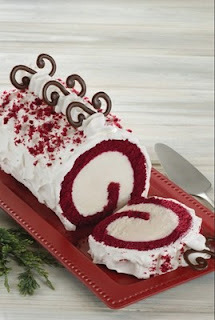 This is taking a familiar dairy base and adding a touch of something from over the border, across the ocean or a flight away. Middle Eastern cuisine is on fire in foodservice and shoppers want to explore these tastes at home. Think apple chutney, cardamom-infused honey and curried pistachios. Ethnic also includes a touch of heat, just a touch. Maybe it’s suggested by terms such as kick, sharp or tangy. And move over cold brew to make room for matcha. This is not in beverage only. Expect to see more matcha in everything from yogurt to ice cream. 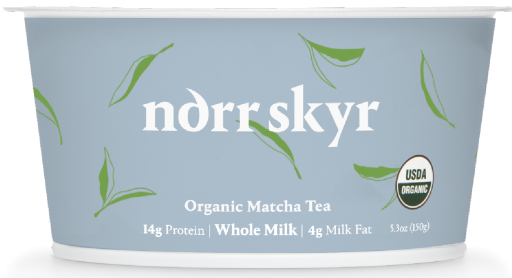 The New Nordic Dairy Company produces traditional Scandinavian strained yogurt in Upstate New York. The original nonfat line comes in Blueberry & Lavender, Elderflower, Gooseberries, Plain and Sea Buckthorn varieties. 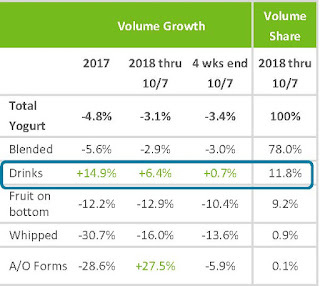 This year the company added three flavored whole milk options--Black Currant, Matcha, and Raspberry & Rosewater—all touting wellness benefits. Black currants contain twice the antioxidants of blueberries and four times the amount of vitamin C found in oranges. Matcha is potent in antioxidants and amino acids. Rosewater is beauty potion with anti-inflammatory qualities. Speaking of rosewater, it is a flavor gaining traction in food and beverage. So is rosé wine. This brings me to the third and final flavor theme. 3. A Touch of Nostalgia. This theme includes boozy flavors. Not so much the modern-day craze of rosé wine, rather the bootlegging whiskeys from around the U.S. Also part of this theme are flavors reminiscent of simpler times, such as cotton candy and root beer floats. 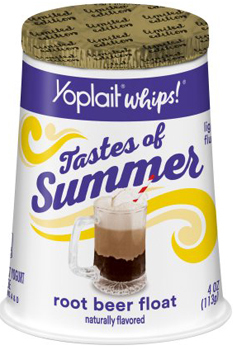 Earlier this year, General Mills offered Yoplait Tastes of Summer. The seasonal line included Original Cherry Sno Cone and Whips Root Beer Float. Chobani has launched the Gimmies kids’ Greek yogurt snack line. The Crunch concept includes Poppin’ Cotton Candy. In addition to Culinary Inspiration, an Ethnic Twist and A Touch of Nostalgia, expect to see more flavor concepts in dairy foods to include whole grains and seeds—as an inclusion or mix-in—often coated with additional flavor. Think chocolate-coated quinoa clusters, pralined pecans with chia, and chipotle-infused honey nuts and oats. 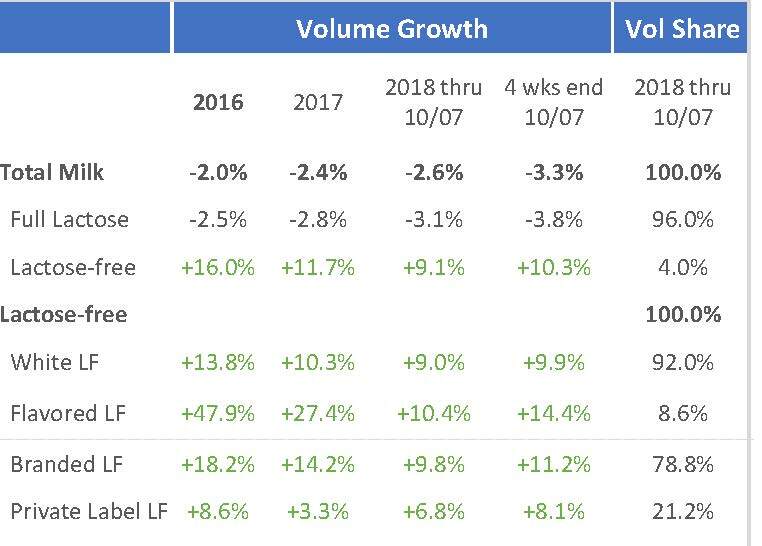 And while I would like to say that unicorns and purple foods are a dying fad, all indicators suggest they will continue to gain momentum in 2019, but only in small batches and limited editions. Think moon milk. Read about it HERE. You got this dairy folks! The Institute of Food Technologists (IFT) recently launched its second annual IFTNEXT Food Disruption Challenge. This is an innovation pitch to help emerging and investment-ready food start-ups, entrepreneurs and innovators gain visibility and make strategic connections to help advance the science of food and its positive impact on the sustainability of the global food supply. Link HERE for more information and an application to participate. Enrollment continues through January 10, 2019. Throughout the competition, finalists are selected in two stages, with six finalists chosen to participate in a six-week mentoring program where they receive guidance from business experts. From there, finalists are selected to present their innovations in a high-profile pitch competition at IFT19 in New Orleans on June 4, 2019. A panel of prestigious judges representing influential sectors of the food and related industries will select the recipient of the IFTNEXT Future Food Disruptor of the Year award, which includes a $25,000 cash prize. IFTNEXT Food Disruption Challenge session attendees at IFT19 will be asked to select an IFTNEXT Future Food Disruptor People’s Choice awardee for a cash prize of $5,000. In addition to the cash prizes, other services and products for entrepreneurial advancement will also be included. IFT19 is an annual event hosted by IFT that brings more than 17,000 science of food professionals together--including scientists, researchers, academics, ingredient, technology and manufacturing companies--with the intention to inspire and transform collective knowledge into innovative solutions that help advance our planet’s food safety, nutrition and sustainability. The end of the year comes with reflection. What was accomplished? What could have been? Where are the opportunities? 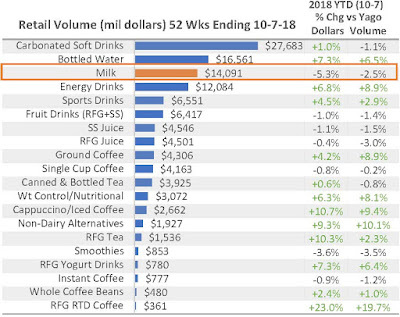 To read about the current State of the Dairy Industry, link HERE to an article I recently wrote on the topic for Food Business News. Some of the most impressive new products in 2018 were in the fluid category. One of my favorites is JoeFroyo Functional Cold Brew, which combines the kick of caffeine from cold brew coffee with probiotics and protein from drinkable yogurt. 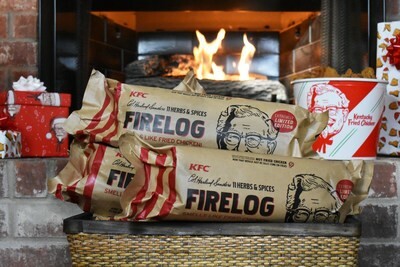 It’s true out-of-the-box innovation. JoeFroyo features 15 grams of dairy protein per 12-ounce serving and six live and active probiotic cultures, all while being 100% lactose free. The beverage is made using high-pressure processing, which extends shelf-life without any chemical preservatives. 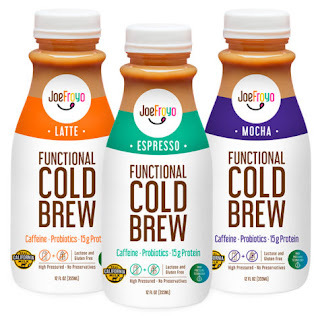 The beverage comes in the ready-to-drink format, as well as an over-ice version (via one-gallon jug for pour overs or a 2.5-gallon bag-in-box to be used in dairy dispensers) and a frozen blended dispensed version. A 12-ounce ready-to-drink bottle contains 270 to 290 calories, 3 to 4 grams of fat, 27 to 28 grams of sugar, and 15 to 16 grams of protein, depending on variety, of which there are three. They are: Espresso, Latte and Mocha. The protein content gets a boost from the addition of milk protein isolate and whey. Shamrock Farms is livening up the milk and beverage department with Rockin’ Protein Energy, the latest innovation in the company’s extensive line of Rockin’ branded protein-enhanced milk products. The new refrigerated beverages combine the naturally occurring caffeine from coffee with a whopping 30 grams of high-quality dairy protein for a powerful one-two punch ideal for sustained energy. Rockin’ Protein Energy is made with real Shamrock Farms milk so it’s a great source of protein and nutrients, while being low-carbohydrate and lactose free and having no added sugar. Rockin’ Protein Energy will be available in U.S. convenience stores this January in three flavors: Café Latte, Caramel Latte and Mocha Latte. The beverage comes in 12-ounce plastic bottles and contain 190 to 200 calories. Targeting the morning daypart, Organic Valley introduced Breakfast Balance. 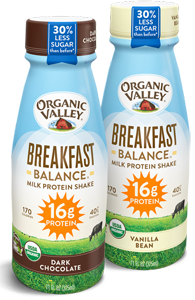 In 2015, Organic Valley introduced Organic Balance, an all-organic, fair trade milk protein shake designed for busy working women who wanted a healthy, delicious and convenient option for energy and nutrition in the morning. The product has been reformulated and repositioned in response to consumer preferences and retailer interest. New Organic Valley Breakfast Balance now contains 30% less sugar, but it’s still loaded with 16 grams of protein and 40% of the recommended daily allowance of calcium, all from clean, smooth, delicious and real organic milk from Organic Valley’s 2,000 family farms. The packaging has been redesigned to emphasize the use occasion: an on-the-go breakfast that is packed with enough nutrition for the most important meal of the day. What hasn’t changed is that Breakfast Balance is still lactose- and gluten-free, still shelf-stable, and like all Organic Valley products, never contains GMOs, antibiotics, synthetic hormones, toxic pesticides or artificial sweeteners. The shake comes in 11-ounce plastic bottles in two flavors: Dark Chocolate and Vanilla. One bottle has a suggested retail price of $2.99; a four-pack, $10.99; and a 24-pack, $24.99. For younger consumers, Nestle USA rolled out Nesquik SuperBreakfast protein breakfast milk drink. Made with real milk, the shelf-stable drink contains no artificial sweeteners, colors or flavors, and no high-fructose corn syrup. The drink comes in Chocolate and Vanilla flavors in 8-ounce plastic bottles, which are sold in six packs. Thanks to the addition of milk protein concentrate, each bottle contains 12 grams of protein and much more, including calcium and vitamins A and D.
What the first three product lines offer is a real dairy milk beverage that is also lactose free. This is something to consider when innovating in the dairy beverage sector. By eliminating lactose, your innovation may keep those shoppers who avoid lactose in the dairy milk category. 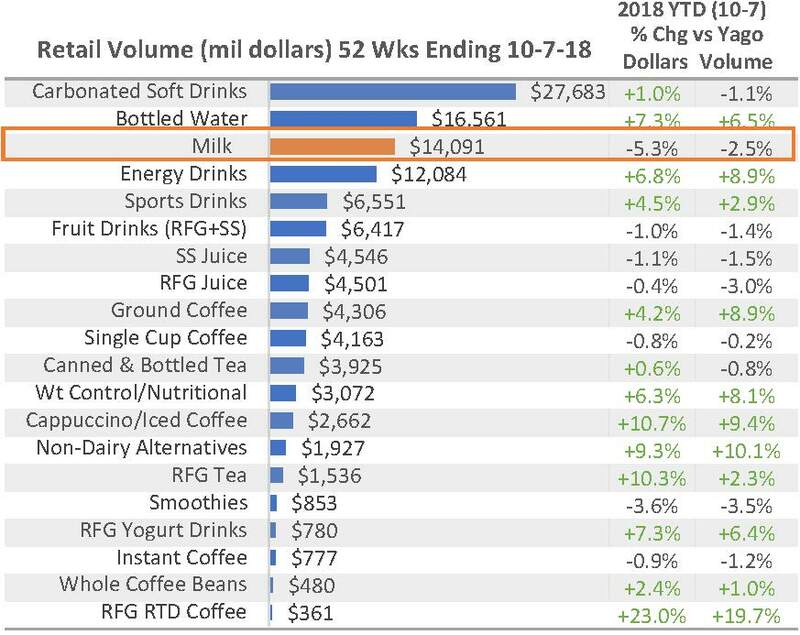 A shout out goes to all the fluid milk processors who started offering lactose-free options in 2018. I hope many more follow this coming year. I was recently asked by a dairy if they were to only offer one or two lactose-free options, what would I recommend. 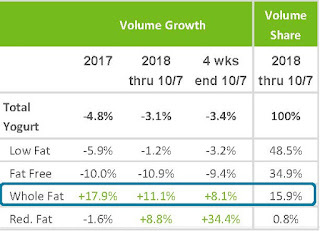 I suggest whole milk first, followed by chocolate whole milk, as whole milk is the only fat level of fluid milk posting retail sales growth in the U.S. Also in 2018, whole fat took the number-one share spot among fat levels. 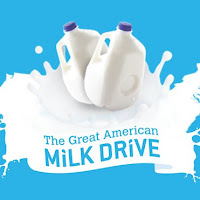 Congrats to Clover Sonoma, a third-generation family-owned and operated dairy that entered the lactose-free milk category with a full range of products. The Non-GMO Project Verified lactose-free milk line comes in whole milk, 2% reduced-fat, 1% low-fat and fat-free white, as well as a chocolate whole milk. Clover Sonoma adds lactase enzyme to fresh milk, which breaks down the lactose into two more easily digested sugars: glucose and galactose. The half-gallon gable-top cartons retail for about $4.99. Lactose-free formulating and labeling should be considered for all dairy foods innovations, as digestive health is on top of mind among consumers. And as mentioned, by eliminating lactose—a disaccharide unique to all mammalian milk—from dairy foods, you may prevent consumers from switching to dairy alternatives, when the sole reason for the swap is to avoid lactose. 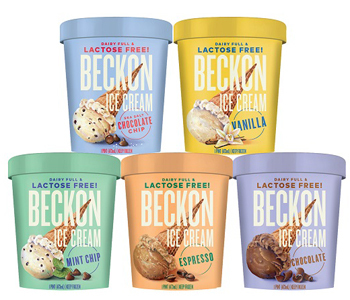 That’s the goal of Beckon Ice Cream: to enable lactose-sensitive ice cream lovers the opportunity to have real dairy ice cream once again. The company uses traditional ice cream ingredients, including milk and cream. With the help of added lactase, the company eliminates lactose from the product. This process also adds some natural sweetness to the ice cream. Beckon pints come in five flavors--Chocolate, Espresso, Mint Chip, Sea Salt Chocolate Chip and Vanilla—and retail for about $5.99. 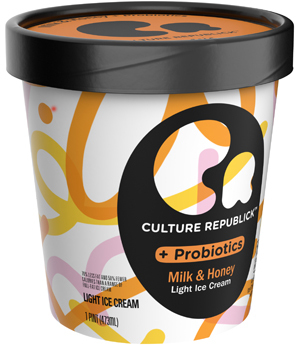 Building on the digestive health theme, Unilever developed Culture Republick, a probiotic cultured ice cream that supports art culture by featuring the designs of emerging artists on the pint packages. Culture Republick comes in seven unique flavors, with each pint containing three billion live active cultures, 400 to 500 calories, 16 to 18 grams of protein, 11 to 12 grams of fiber and no artificial sweeteners. Flavor combinations are: chocolate and cherry, cold brew coffee and chocolate chip, lemon and graham cracker crumb, matcha tea and fudge, sweet cream milk and honey, pistachio and caramel, and turmeric chai with cinnamon. 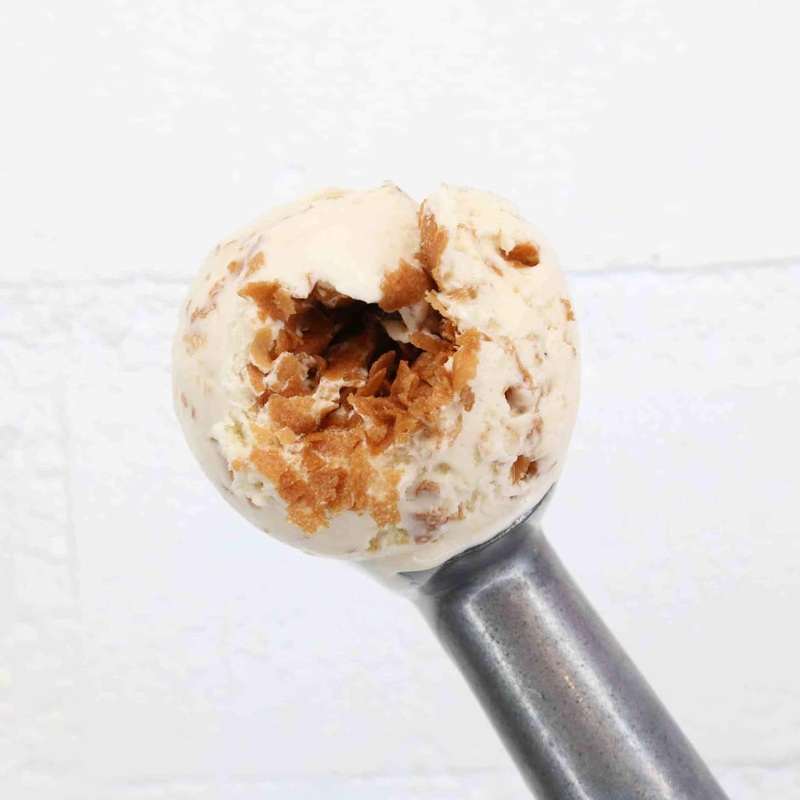 Though not lactose-free---something definitely to consider based on the ingredients and process--Wells Enterprises impressed this year with its rollout of the Chilly Cow better-for-you ice cream brand. 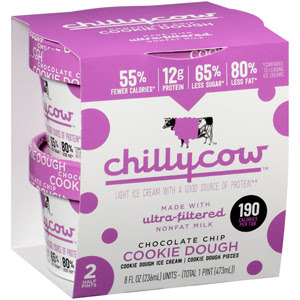 Another first, and so far only-of-its-kind, Chilly Cow is made with ultra-filtered milk, which boosts protein content while providing for 55% fewer calories, 70% less fat and 60% less sugar than regular ice cream. The new brand comes in seven flavors, as a two-pack of half pints and in novelty bars. The flavors are: Brown Butter Salted Caramel, Chocolate Brownie Batter, Chocolate Chip Cookie Dough, Cookies N’ Cream, Mint Dark Chocolate Chip, Sweet Cream Peanut Butter and Vanilla Graham Swirl. An 8-ounce tub flags that it provides 12 to 13 grams of protein, depending on flavor. Turkey Hill shook up the novelty case with the roll out of Decadent Delights. The new line of indulgent, sophisticated treats blends premium ice cream with an abundance of fruit to create a four-flavor selection of bars and three flavors of individual-serving parfaits. 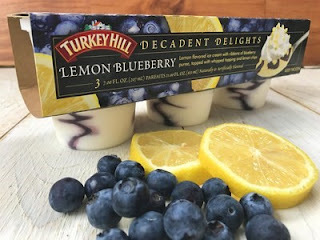 The parfaits come in three flavors: Lemon Blueberry, Mixed Berry and Strawberry, with each 4-ounce cup containing 250 to 270 calories, 12 to 12 grams of fat and 2 to 3 grams of protein, depending on variety. The Decadent Delights bars include Cherry, Chocolate Covered Strawberry, Coconut and Tropical Mango. Each flavor is tailored for audiences looking for an indulgent dessert packed with fruit, chocolate and other premium ingredients. 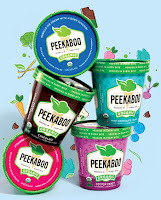 Another noteworthy frozen innovation is Peekaboo Organic Ice Cream with Hidden Veggies. The new pint concept comes in five varieties: Chocolate with Hidden Cauliflower, Cotton Candy with Hidden Beets, Mint Chip with Hidden Spinach, Strawberry with Hidden Carrot and Vanilla with Hidden Zucchini. On the cultured side of the refrigerated dairy case, Darling Foods impresses with its Darling Pickle Dips, a line of refrigerated dips made from a cream cheese and white bean base. The base is blended with pickled vegetables, herbs and spices into four varieties: Fiery Jalapeno & Roasted Tomato, Original Dill Pickle, Spicy Pickle and White Cheddar & Mustard. The cream cheese gives the dips richness, while the pureed beans provide a slightly chunkier texture than most creamy dips. Each variety has some taste of dill pickle without being overwhelming. 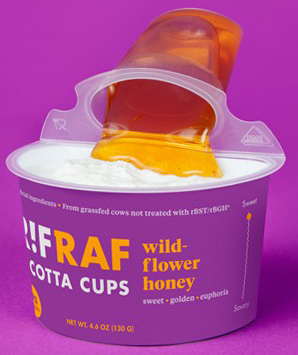 RifRaf Ricotta Cups is another noteworthy first. This snack combines spoonable, lightly cultured whole milk ricotta and a sidecar of adventurously flavored jams and honeys. RifRaf Ricotta Cups come in five flavors: Meyer Lemon, Serrano Pepper Honey, Strawberry Balsamic, Sun-Dried Tomato and Wildflower Honey. The ricotta is made from milk from grass-fed cows, with each cup providing 10 grams of protein. The product comes in 4.6-ounce dual compartment cups and retails for $3.39. 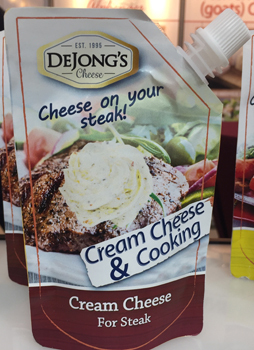 DeJong Cheese is rolling out Cream Cheese & Cooking. These multi-use recloseable squeeze pouches feature flavored cream cheeses intended for use as a meat or fish topping, or to be used in the creation of sauces or other creative cooking applications. There’s a chili curry-flavored cream cheese for steak and a tandoori flavor for chicken. For fish, there’s furikake-flavored cream cheese. 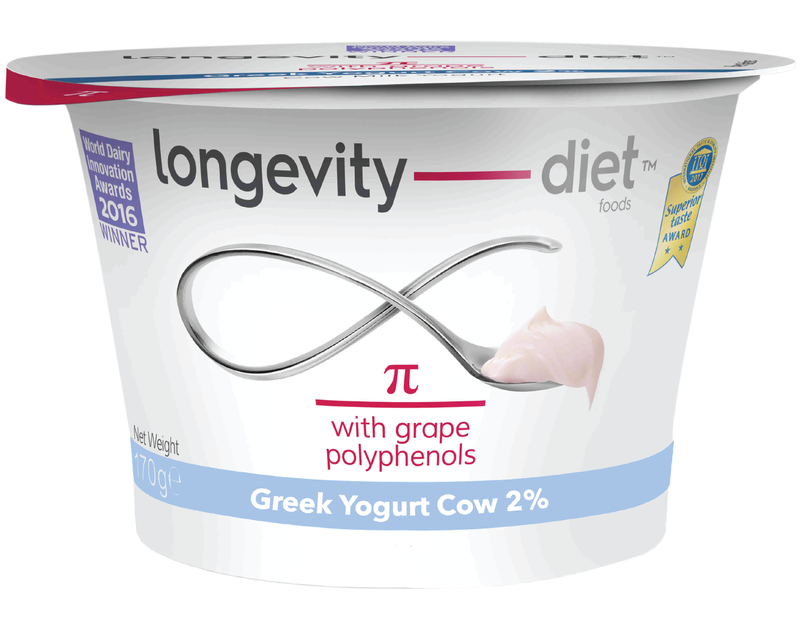 Longevity Diet Foods introduced a range of health and wellness yogurts enriched with functional ingredients. All three lines are 2% milkfat and plain in flavor. Each line includes a cow, goat and sheep milk option. 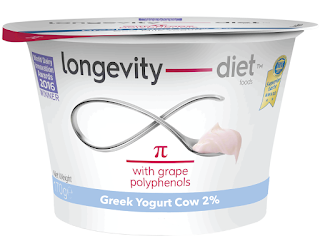 The Longevity π line is enriched with grape polyphenols, powerful antioxidants with multiple functions, including promoting anti-aging and boosting the immune system. Longevity m is enriched with ceremonial green tea catechins, powerful antioxidants with multiple functions, including boosting metabolism. Matcha also contains the amino acid L-theanine, which is known to impact brain function by both relaxing and helping concentrate at the same time. Longevity µ is enriched with inulin and chios µastic, both of which are associated with having a positive impact on the gastrointestinal system. Keto diet-friendly foods will be a big call out in 2019. It’s all about fat and protein, and milkfat and dairy proteins make for delicious innovations. When carefully crafted, no-added-sugar claims are possible. 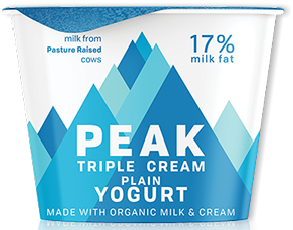 Peak Yogurt is doing that with its 17% milkfat, cream-on-top triple cream yogurt. It’s rich, creamy and satiating, so it doesn’t require sugar or other additives to satisfy and fuel the mind and body, according to the company. 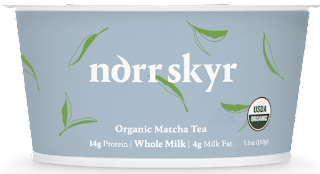 The plain, unsweetened variety comes in a 5-ounce cup and contains 270 calories, 24 grams of fat, 8 grams of protein and a mere 4 grams of total carbohydrates (solely from inherent lactose). There are also two flavored options: Strawberry and Vanilla. They are low-carb and “keto-ish” with 260 or 270 calories, 21 to 22 grams of fat, 7 grams of protein, and 10 to 11 grams of sugar. The latter comes from the inherent lactose as well some added cane sugar. 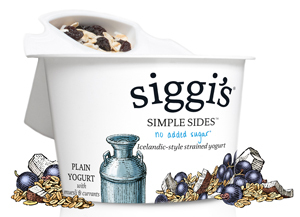 Siggis, the maker of Icelandic yogurt with simple ingredients and not a lot of sugar, continues to impress with siggi’s Simple Sides. 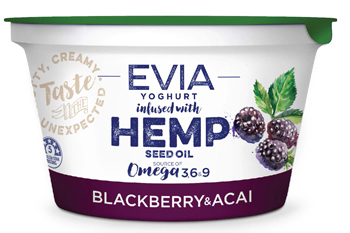 The brand’s new product line brings together whole milk yogurt and simple, no-added-sugar mix-ins for a nourishing, wholesome snack with more protein than sugar in every cup. The four varieties are: honey yogurt with dried figs and walnuts, plain yogurt with muesli and currants, vanilla yogurt with almonds and dried cherries, and vanilla yogurt with dried coconut and cacao nibs. 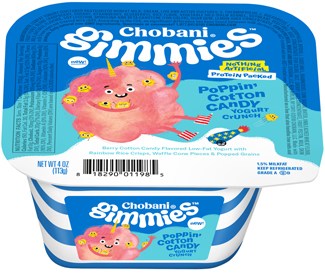 The product varieties contain, on average, 15 grams of protein and 11 grams of sugar per 5.3-ounce serving, offering a more positive nutritional profile amidst the traditionally sugar-filled yogurt with mix-ins product segment, which averages 18 grams of sugar per 5.3-ounce serving, according to the company. 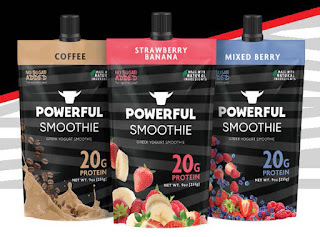 Powerful, a four-year-old brand credited with launching the brogurt category (manly yogurt), continues to shake up the refrigerated dairy case with new Greek yogurt-based high-protein smoothie pouches. The pouch product has a resealable cap and targets consumers looking for a nutritious, satiating, grab-and-go snack. Milk protein concentrate enables each 9-ounce pouch to deliver 20 grams of dairy protein. With no added sugar and made with only natural ingredients, including 2% milk, each pouch contains 170 to 180 calories, 4 grams of fat and 11 to 12 grams of inherent sugar, depending on variety. The fruit base includes chicory inulin, erythritol and stevia, which enables a no-added-sugar claim. The line made its debut early in the year in Coffee, Mixed Berry and Strawberry Banana varieties and was quickly picked up by small and large retailers across the U.S. The suggested retail price for a single pouch is $2.19. Innovation in the cheese sector focused mostly on new formats—and positionings--of old favorites, with snacking and protein the focus. Laurels Farm, for example, grew its eatlean Protein Cheese brand. The eatlean cheese is made just like any other regular cheddar using natural ingredients by real cheesemakers on a real dairy farm, according to the company. It is, however, lactose-free, with a 100-gram serving containing 169 calories, 3 grams of fat and 37 grams of protein. Regular cheddar only contains about 25 grams of protein. 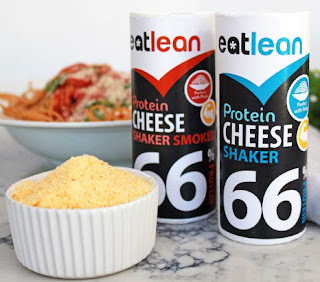 The eatlean Protein Cheese comes in many formats, including snack bars, and most recently, Protein Cheese Shaker. It’s dried and grated eatlean cheese and marketed as a way to add flavor and protein to prepared foods. In this format, it is 66% protein. The shaker product comes in original and smoked varieties. 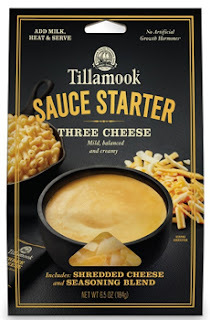 Tillamook introduced Sauce Starter, which is described as “real cheese meets expertly blended spices to give you creamy, homemade cheese sauce in half the time.” Sauce Starter is a 6.5-ounce package of shredded cheese with a packet that contains seasonings and other saucy ingredients, namely emulsifying and stabilizing agents. The consumer combines the cheese and dry mix with one cup of cold 2% milk. The mixture should be stirred over medium heat until the cheese melts. It makes 1.5 cups of sauce. There are four varieties: Aged Cheddar (sharp and extra sharp cheddar with parmesan), Creamy Alfredo (white cheddar, parmesan and Monterey jack with a hint of garlic and nutmeg), Spicy Queso (medium jack, pepper jack and habanero jack with a dash of habanero pepper and garlic seasoning) and Three Cheese (medium cheddar, Colby jack and Monterey jack). The package has a suggested retail price of $3.99. 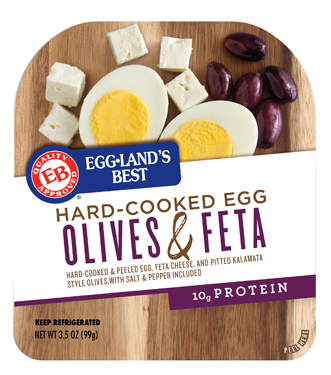 While many cheese snack combo kits debuted this year, one that was particularly impressive came from Eggland’s Best. Each snack pack contains an Eggland’s Best hard-cooked and peeled egg, along with cheese and one other food in a portable and convenient snack tray. The one that caught my eye includes olives and feta cheese, as this trio has not been offered before. The other combination snack packs include bacon and cheddar cheese, chocolate-covered almonds and cheddar cheese, and salame and provolone cheese. A single-serve pack contains 10 to 20 grams of protein and sells for about $3.29. 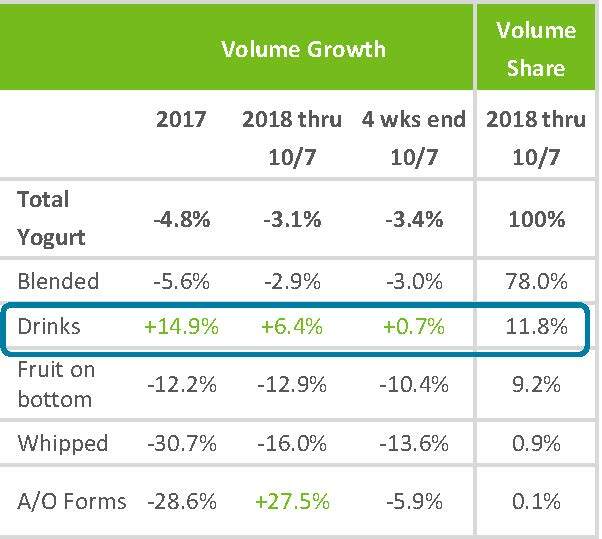 Congratulations to all companies who invest and innovate to keep dairy foods relevant to today’s consumers. It’s that time of year when food industry analysts predict product trends for the coming year. 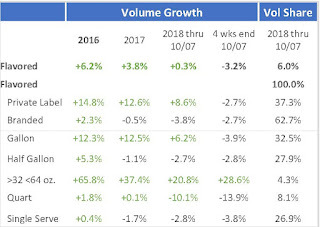 Whole Foods’ list has been garnering the most attention in consumer media, while Mintel, Innova, the Specialty Food Association and others are being picked up by the trade press. 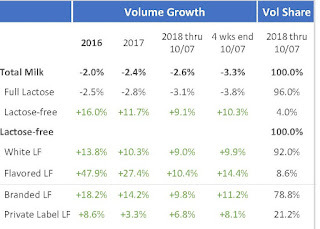 I like to analyze the predictions and, after 25-plus years of writing for the dairy industry, share with you the forecasts that are relevant to the dairy processing industry, along with offering up some forward-thinking innovations. 1. Probiotics and Fermented Foods. This past year saw probiotics and fermented foods and beverages go mainstream. 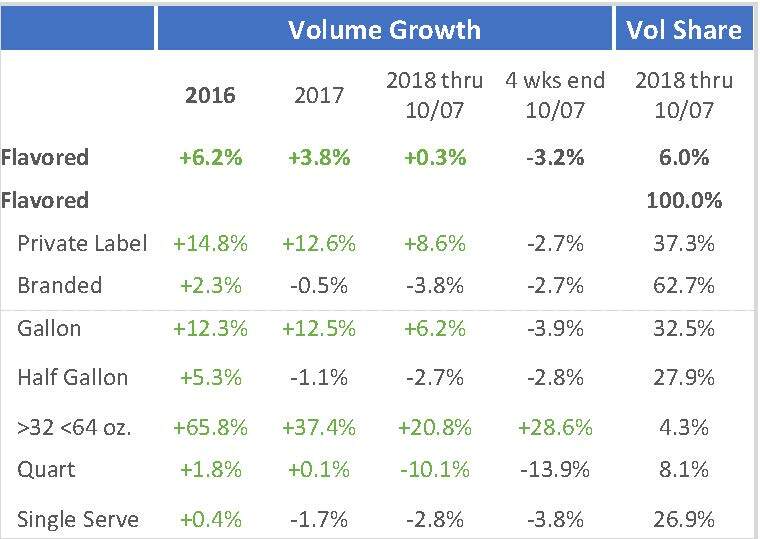 Expect more of this, along with more varied applications, as new shelf-stable strains find their way into products merchandised at ambient temperature. This presents an opportunity for the dairy industry to get aggressive with innovation. For long, many have been asking “what’s the next Greek yogurt?” The answer is probiotic dairy shots. Think Yakult and Activia, and take it to another level. These fermented drinks may be formulated with other value-added ingredients for additional benefits. Think “beauty from within” in a collagen shot. How about a relaxing shot containing dairy bioactives? 2. Healthy Fats and Keto Friendly Foods. 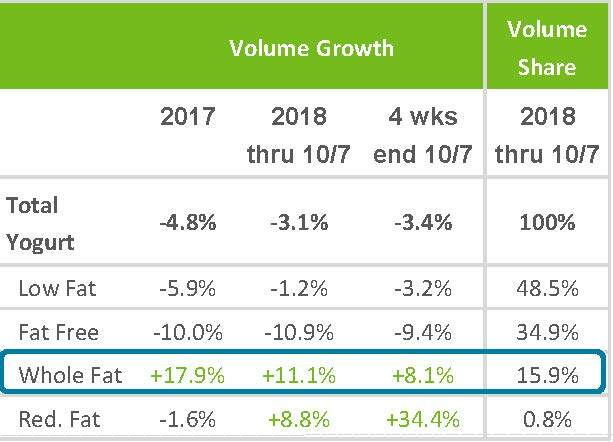 The Whole Foods forecasters say fat is back in a big way, and keto diet-friendly foods will be a big call out in 2019. It’s all about fat and protein, and milkfat and dairy proteins make for delicious innovations. When carefully crafted, no-added-sugar claims are possible. 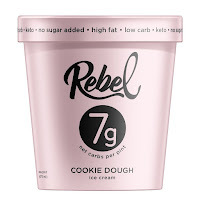 Rebel Creamery offers a premium, high-fat, low-carb, no-sugar-added ice cream. Rebel Ice Cream uses only all-natural, keto-friendly ingredients that won’t raise blood sugar, raise insulin levels or kick you out of a fat-burning state. The focus of this grain-free, gluten-free keto-friendly product is to be very low in net carbohydrates. One pint contains 5 to 8 grams and no added sugars. This is achieved through the use of erythritol, monk fruit and chicory root fiber. Fat is also a priority. The use of cream and egg yolks make Rebel one of the highest fat ice creams in the market. One pint contains 56 to 76 grams. A half-cup serving contains 150 to 200 calories, 14 to 19 grams of fat, 2 to 3 grams of fiber, 0 grams of sugar, 7 to 10 grams of sugar alcohol, and 2 to 3 grams of protein, depending on variety. SmashPack manufactures Protein Smoothies, a line of all-natural, high-protein and real fruit nutritional snacks that come in spouted squeeze packs. Each shelf-stable pouch is packed with 14 grams of high-quality whey protein, one serving of real fruit, 5 grams of healthy fats and only 180 calories. The company recently reformulated the smoothie snack with medium-chain triglyceride (MCT) oils, which are trending as one of the hottest health and wellness ingredients for 2019. MCT oils are healthy fats recognized as optimum fuel sources for both brain and body, and, when part of a high-protein and very-low-sugar product, appeal to the growing number of consumers following a ketogenic diet. They pair great with value-added dairy proteins to make nutritional snacks on target with today’s consumers’ health and wellness goals. 3. Hemp. That’s right, hemp. And why add it to value-added dairy foods? Hemp seed oil is extracted from cannabis plants but it doesn’t contain tetrahydrocannabinol (THC), which is the chemical responsible for most of cannabis’ psychological effects. The oil is rich in heart-healthy omega-3 fatty acids and is a concentrated source of vitamins, minerals, amino acids and enzymes. It is reported to improve skin, hair and nails; reduce risk of heart disease and cancer; aid in weight loss; lessen inflammation and help with better brain function. And, being an oil, disperses best in a fat-containing system, including dairy. Evia Yoghurt Company is rolling out Hemp-seed infused yogurt to the Australian market. The new superfood yogurt comes in three new flavors: no-sugar-added Natural, Mango, and Blueberry and Acai. Innovators are creating new product categories and disrupting old ones. The movement is becoming one situated in the larger context of sustainability: intertwined with upcycled products, as more companies turn to root-to-stem ingredients to combat food waste; snacks made from rescued bananas, or flours made with spent grains or pulp, according to the Specialty Food Association. Think “the blend.” These are burgers, meatballs and other ground meat formats, which, on average, are a 50-50 blend of beef with umami-rich mushrooms. By mixing plant with animal, the nutritional profile of the product is improved and there’s an environmental story with energy, water and land savings. Dairy blends well with plant-based ingredients, including legumes, fruits and vegetables. Think Darling Foods’ Darling Pickle Dips, a line of refrigerated dips made from a cream cheese and white bean base. The base is blended with pickled vegetables, herbs and spices. The cream cheese gives the dips richness, while the pureed beans provide a slightly chunkier texture than most creamy dips. Each variety has some taste of dill pickle without being overwhelming. 5. Healthy Aging and Edible Beauty. Noted as emerging by last year’s Specialty Food Associations’ Trendspotter panel, collagen is a full-fledged trend in 2019, and part of a bigger move to develop products that promote skin health and appearance, and overall beauty from within. It’s all about healthy aging. And, adding dairy bioactives back into dairy foods makes sense. Food and drink will build on today’s dialogue about wellness and transition into more solutions for healthy aging, according to Mintel. Formulations can be developed for people of all ages to efficiently consume vitamins, minerals and other ingredients that are potentially beneficial for bone, joint, immune system, brain health and overall wellbeing. Mintel cites fairlife milk with DHA Omega-3 as an example. The lines comes in 2% and whole fat formulations. The milk is lactose free and concentrated in protein as a result of being processed using ultrafiltration. Here’s an innovation from abroad. Polish dairy company Bakoma now offers a senior-friendly line of yogurt and yogurt drinks that are lactose-free and enriched with calcium and vitamin D to help maintain healthy bones and support muscle and immune system functioning. Check out that shot-style packaging. That’s what I’m talking about! Both sets of my grandparents were Polish immigrants. This is not how I remember my busias and dziadzias. Check out this VIDEO. 6. Flavor Adventure. And for goodness sake, if you are going to get creative and push the envelope in terms of dairy innovation, please do not limit flavor offerings to chocolate, strawberry and vanilla. Mixed berry is no longer edgy, by the way, and strawberry kiwi is dead. Younger generations—Millennials and Gen Z--have had unprecedented exposure to global culture and cuisine from an early age. They are adventurous and seek experience in their travel and in their food, which has led to a shift in interest to authentic regional fare. Targeting increasingly adventurous consumers, set on new discoveries and experiences, will be key to developments in the food and beverage industry in 2019, according to Innova. 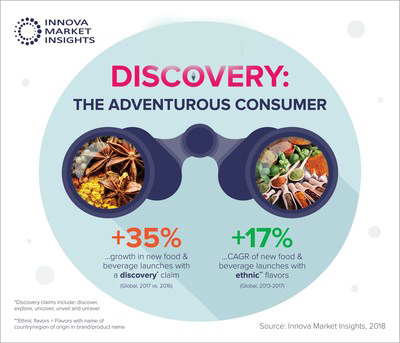 The connected world has led consumers of all ages to become more knowledgeable of other cultures, contributing to 35% growth of “discovery” claims, when comparing 2017 and 2016 new product launch numbers.